Barrett Robinson can help you transform your outdated, boring cafeteria into a relaxed, attractive environment that students will be drawn to for dining and socializing. Renovating your cafeteria into a food court can increase seating capacity and enhance school pride. 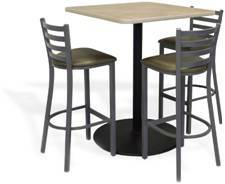 Design can be tailored to your budget--modernize your food service environment for minimal cost, or customize your cafeteria with upscale decor and furnishings. Let us provide you with an initial layout and concept drawing, free of charge, so you can see the dramatic change with your own eyes. Decorative artwork-wall art, designed to coordinate with furniture, cabinetry and other cafeteria items to create overall theme.